In June. Ehem, so it’ll be goodbye.. Pretty much goodbyes, tears, laughs, smiles in our last hangouts together drawing closer to the end where I, myself have to leave and: right now I don’t know what to feel or do, like, what am I suppose to feel, I’m leaving a life behind I’ve been working hard on. All on my own, with help from friends that doesn’t even live here or have any relations to Thai-life whatsoever, it’s all just like a short novel, too short with a too open ending and you can’t predict it’s “continued story”. /le heavy artistic sigh. – I’ll never get proper blogging done, uhhh you bloody New Year’s Resolutions are a bugger! 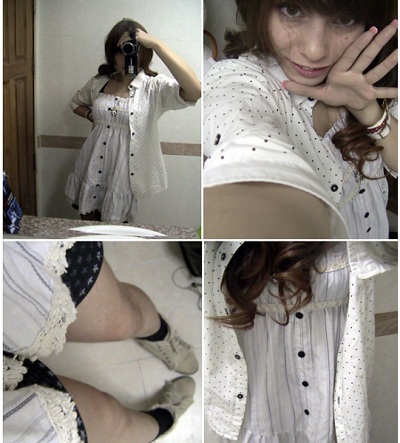 Anyway, this Saturday (12/05/12) I had a day out with Ayaha and we went to Central World. I was blessed, literally, to see the Oishi Cosplay Idol convention, which I had attended once before. In 2008 June with my Dad, when he was still alive. Super lucky and 100% just by accident that we were able to see it, so sad we couldn't stay longer (also that there wasn’t any K-On! Cosplayers, /sigh) Made me remember my cosplay days and miss dressing up like that. I stumbled out in normal clothes and for some reason people asked if they could take my picture as well, weird. Additional to weird just clearing a fact - I have mixed colored eyes, which isn't always super noticeable if you just glance on my face quickly lol but - apparently people thought they were circle lenses!! Σ(￣皿￣;; wat dat duccccccck. Misato gave me her bags she thought she didn't need, they are bangin'(!) why throw em away? 2. I love that blue bag from Japan!